This is the first of Melville House’s “Duel” series to feature a serious duel. The others were life or death situations, but they were part of an overall comic or satirical structure that made fun of dueling or at least critiqued it. 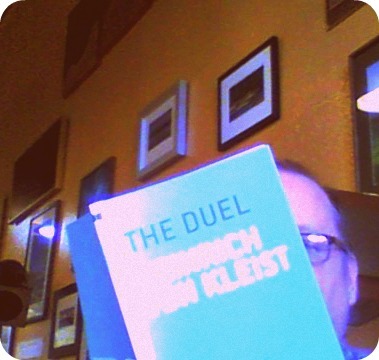 In Heinrich Von Kleist’s novel, translated by Annie Janusch, the duel is taken seriously by all involved, author included. Set in the late fourteenth century, The Duel concerns a noblewoman whose husband has been murdered under circumstances that cast her in a very bad light. Her honor in ruins, she has no one to defend her against the charges brought by her brother-in-law who has an airtight alibi for the night of the murder. She begs for sanctuary from an old friend, a knight who at one time was in love with the noblewoman. He agrees to take her in and defends her the only way he can, by challenging her accuser to trial by combat, a duel to the death. Let God reveal the truth. The reader knows that the noblewoman is innocent as does just about everyone else involved. However, her knight is wounded in the duel so badly that he is unable to continue the fight. So it appears that God has ruled in favor of the brother-in-law. The knight quickly recovers and asks to carry on with the duel the following day. The brother-in-law becomes infected from the slight wounds he received and begins to die. Just what was God thinking? Heinrich Von Kleist wrote The Duel in 1810, just one year before his own suicide. I’m not expert enough on Germany in the early 19th century to say, but I expect the puzzle presented by this duel’s outcome was one that would have interested readers in a sincere way. None of the characters are unbelievers. The noblewoman and the knight both believe themselves to be guilty due to the results of the duel. They are as confused by the message God has sent them as faithful readers must have been. Everybody believes God has rendered his verdict through the duel, but just what was that verdict. It’s just the sort of conundrum Medieval scholars would have loved: what if the loser of a duel survives but the winner dies? Who then has God revealed to be guilty. It was a fun read, one that I enjoyed and one that I hope to read again some day. I loved this novella and hope to reread it someday. The mixed messages from God theme was done to perfection by Kleist. It really was. Do you think he intends the reader to question the entire notion of messages from God? I felt he really set the reader up for this. You have to see all “messages from God” as matters of interpretation after this, but none of the characters questioned the notion that God was speaking through the duel’s result.